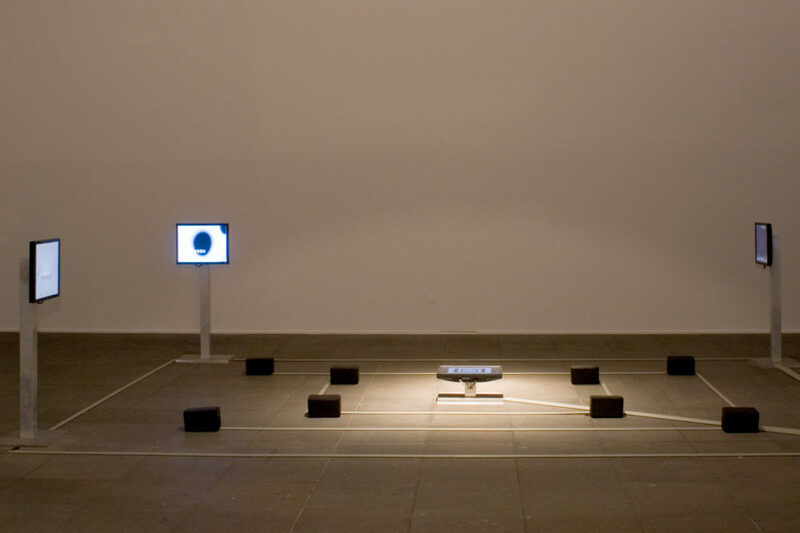 The positions of the five monitors and eight speakers in this work define three concentric rectangles and their center. 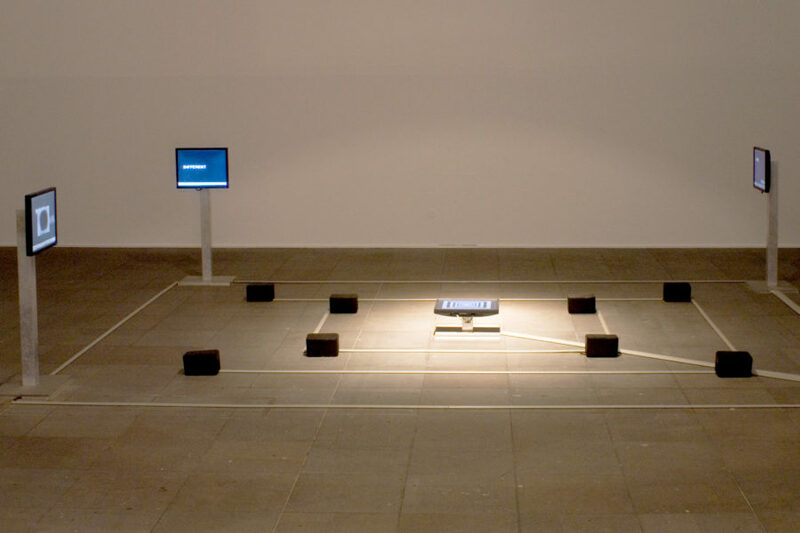 Four monitors define the four corners of the parameter of the outside rectangle. Moving inward, four speakers are at the corners of the next concentric rectangle and four more speakers at the innermost concentric rectangle. In the center is one monitor facing up, as are all the speakers. Facing down from the ceiling is a camera with an automated zoom lens that ranges from all the way in (filling any of the outer monitors with the image of the central monitor-screen) to all the way out (filling any of the monitors with the image of the whole installation from the outer rectangle to the center). The central monitor displays a prerecorded loop (variation of Black/White/Text) of negative video feedback (alternating black-and-white rectangles enfolding and transforming continuously). 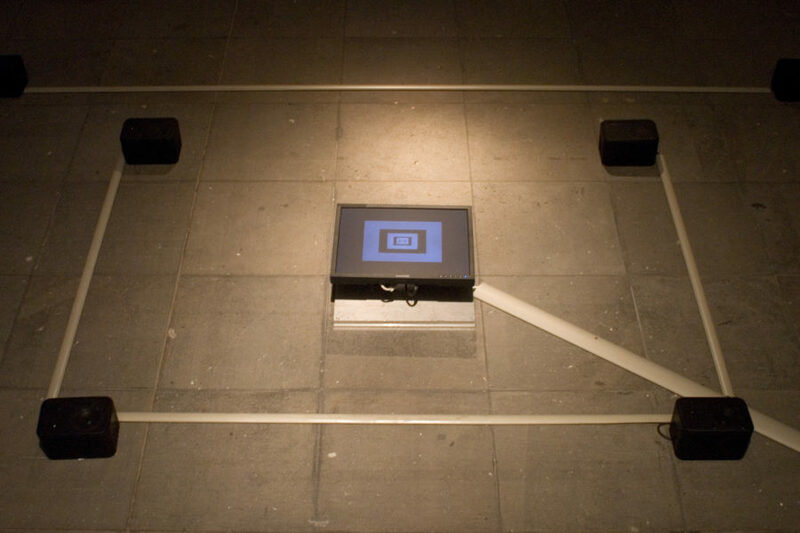 These expanding and shrinking recorded rectangles (like the real time image from the overhead camera displayed on the outer four monitors) expand and shrink in general sync with the seven sound tracks. These tracks form the score of the spoken text. The text describes the process of feedback and is structured reflexively, mirroring the principles of feedback itself. The first voice/track sets the measure for pulsating changes with the rhythmic pacing of "rec—tan—gle" and embeds progressively larger phrase units from the verbal text (noted below) in each of the six other tracks, proceeding backwards in multiples of 3 syllables (i.e., 3, 6, 12, 24, 36, 48, 96) from the end-word “rectangle.” (For example: first track: 3 syllables = "rectangle," second track: 6 syllables = "within a rectangle," third track: 12 syllables = "the frame of reference within a rectangle," etc.) The live camera image alternates on the four monitors defining the outer perimeter, changing from positive to negative. 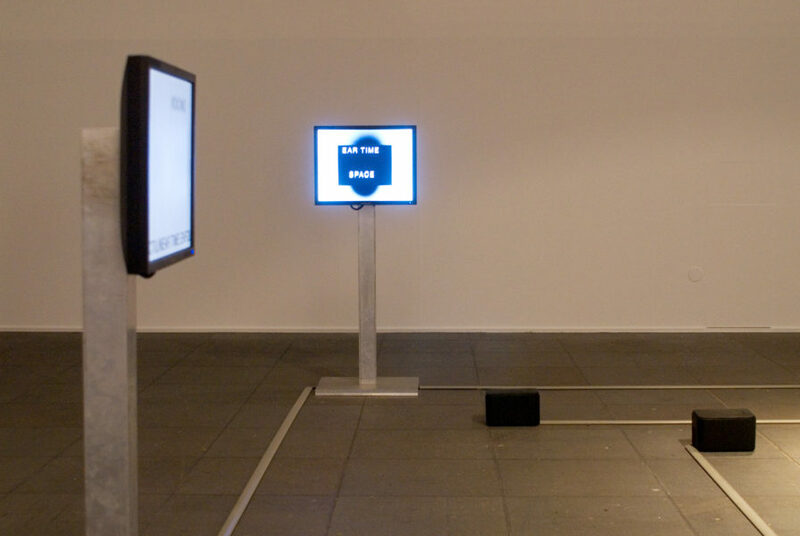 The text scrolls across the bottom of all four screens, repeatedly moving from right to left, beginning to end. Occasionally written words derived from the scrolling text float up the screen in various ways forming other word couplings and word play. An example of this work was first shown in the exhibition “Glass Onion, Installation for Video, Sound & Text: A Topological Mapping” at And/Or Gallery, Seattle, Washington, January 9 – 24, 1981. “Art & Technology: Electronic Visions,” Hudson River Museum, Yonkers, New York, July 24 – September 4, 1983. Quasha, George. “Notes on the Feedback Horizon.” Glass Onion. Barrytown, New York: Station Hill Press, 1980, unpaginated. Electronic Visions. Program notes. Yonkers, New York: Hudson River Museum, 1983, unpaginated. Furlong, Lucinda. “A Manner of Speaking: An Interview with Gary Hill.”Afterimage 10, 8 (March 1983), pp. 12, 15, 16. Sturken, Marita. “Out of sync: Hudson River Museum, Yonkers, New York.” Afterimage 11 (November 1983), p. 19. Sturken, Marita. “Electronic Visions.” Afterimage (November 1983), p. 19. Sarrazin, Stephen. Chimaera Monographe No. 10 (Gary Hill). Montbéliard, France: Centre International de Création Vidéo Montbéliard, Belfort, 1992, pp. 39, 54, 82. (Including an excerpt from an interview with Gary Hill). Gary Hill: Sites Recited. Long Beach, California: Long Beach Museum of Art, 1993, pp. 14 – 18. Mignot, Dorine. Gary Hill. Amsterdam: Stedelijk Museum; Vienna: Kunsthalle, Wien, 1993, pp. 82, 83, 86, 87, 95. Van Assche, Christine and Corinne Diserens. Gary Hill. Valencia: Instituto Valenciano de Arte Moderno (IVAM), Centre del Carme, 1993, pp. 86, 87, 90, 91, 99. Morgan, Robert C., ed. Gary Hill. Baltimore: PAJ Books / The Johns Hopkins University Press, 2000, pp. 82, 109 – 113, 190, 201 – 203, 220 – 221. Quasha, George and Charles Stein. La performance elle-même in Gary Hill: Around & About: A Performative View. Paris: Éditions du Regard, 2001, p. 39. Gary Hill: Selected Works and catalogue raisonné. Wolfsburg: Kunstmuseum Wolfsburg, 2002, pp. GHCR 44, pp. 99, 100, 113. Lippens, Nate. “Get trapped in Gary Hill’s feedback loop at 911 Media Arts Center.” http://seattlepi.nwsource.com/theater/327885_visual17.html (August 16, 2007). Odin, Paul-Emmanuel. L’absence de livre [Gary Hill et Maurice Blanchot – Écriture, vidéo]. Marseille: La Compagnie, 2007, pp. 118, 295, 296. Quasha, George and Charles Stein. An Art of Limina: Gary Hill’s Works and Writings. Barcelona: Ediciones Polígrafa, 2009, pp. 96 – 99, 579. Note: This text is also used in the single-channel video work Black/White/Text, 1980, and in the performance of the same name. A texture is drawing a continuum from one voice to another differentiated by measuring the distance between sending and receiving messages voicing the following: rectilinear time enfolds the negative and positive spaces expanding the image that text occupies the space before and after the frame of reference within a rectangle.